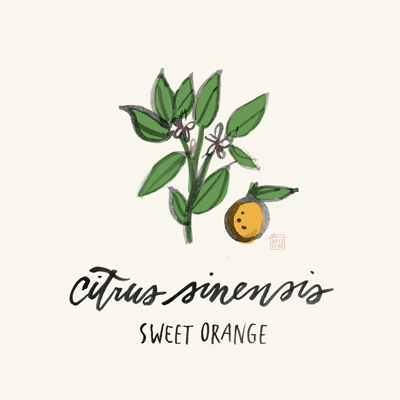 Sweet orange (citrus sinensis) oil has an uplifting, warm scent, like a freshly peeled clementine. It is thought to help with sadness and anxiety, and promote digestion and detoxification in the body. Try adding a drop or two to a glass of cold water, and sipping slowly. It also has effective anti-bacterial properties, so you could add it to a diluted vinegar solution for wiping down your counters! 1 | DoTerra essential oil: This company makes some high-quality essential oils and this one is derived from wild orange. This link offers good suggestions on how to use this oil & why. 2 | Threla hydrating facial lotion: My go-to daily facial moisturizer. It contains argan & rosehip seed oil and is lightly scented with sweet orange oil, blackcurrant absolute and apricot extract. Beautiful! Threla is owned by a most wonderful scientist with a passion for developing safe & effective beauty products. 3 | Jo Malone Orange Blossom Cologne: The description alone is uplifting: "Clementine flower sparkles over a heart of orange blossom and water lily, with warm undertones of vetiver." Word has it that Kate Middleton reaches for this fragrance too! 4 | Art print by Lucile's Kitchen: How lovely is this organic watercolour print? thanks *, i hope it will become a regular feature !